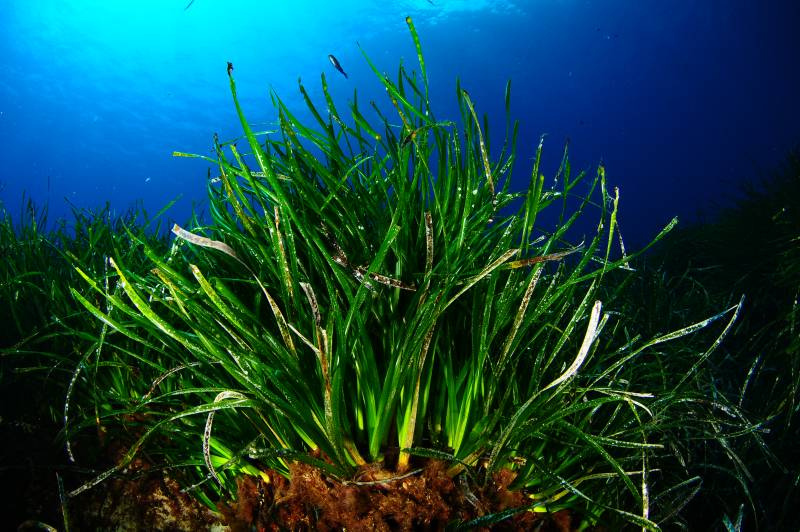 The seagrass Posidonia oceanica (Figure 1) is native to the Mediterranean and plays important ecological functions such as storing carbon from the atmosphere and acting as a natural barrier, reducing the impact of waves and storms. It is an extremely long-lived species (hundreds to thousands of years old!) and grows very slowly. These characteristics, together with human disturbances such as construction along the shoreline and intensive fishing, are thought to be the cause for population decline observed in the seagrass. Conservation of genetic diversity within species (or intra-specific genetic diversity) is crucial as it is the most fundamental level of biodiversity and can be related to the health status of the species. As human disturbances are thought to be the main cause for seagrass decline and can affect genetic diversity of a population, Jahnke et al (2015) combined results from different studies (meta-analysis) to understand how well genetic diversity correlates with a set of environmental disturbances. In this study, Jahnke et al (2015) used previously published genetic data on Posidonia oceanica and 18 different factors across the Mediterranean that could lead to loss of genetic diversity. The disturbance categories included: 1) non-destructive demersal fishing (fishing on or near the seabed in open ocean) with low bycatch (unwanted organisms that are caught in the nets while fishing for another species); 2) destructive demersal fishing; 3) non-destructive demersal fishing with high bycatch; 4) pelagic fishing (fishing near the surface of the ocean) with low bycatch; 5) pelagic fishing with high bycatch; 6) artisanal fishing; 7) nutrient input (fertilizers); 8) commercial shipping; 9) organic pollution (pesticides); 10) UV radiation; 11) urban runoff; 12) benthic structures (such as oil rigs); 13) ocean acidification; 14) sea surface temperature increase; 15) invasive species; 16) coastal population density; 17) oil spills and 18) risk of hypoxia. The authors modeled these 18 factors against the genetic data and also modeled all the factors combined (cumulative impact) against the genetic data. In addition, values of genetic diversity were categorized as low, medium and high and compared to low, medium and high values for the cumulative impact of disturbance factors. 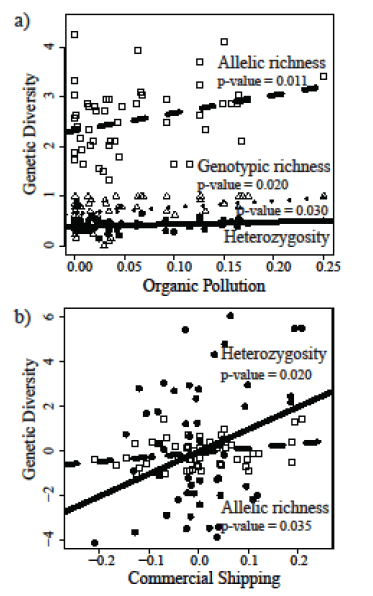 Genetic diversity in terms of observed heterozygosity (an heterozygote is an individual with two different forms of a particular gene) and allelic richness (the number of different forms a gene can have in a population) were positively correlated with organic pollution and with commercial shipping (Figure 2a, b). In Figure 3, the cumulative impacts are represented as red dots and genetic diversity as blue dots. Dot sizes are proportional to the level of diversity and cumulative impact and striped dots indicate that diversity and impact were of the same category level. Contrary to the original expectation, no meadows with low genetic diversity were observed at high impact locations and in the majority of cases, genetic diversity was equal or higher than the impact category. Figure 2. Plots of significant correlations between genetic diversity metrics (heterozygosity and allelic richness) and a) organic pollution (based on pesticides) and b) commercial shipping. Figure 3: Impact map showing the cumulative impact. The cumulative impacts are represented as red dots and genetic diversity as blue dots. Dot sizes are proportional to the level of diversity and cumulative impact and striped dots indicate that diversity and impact were of the same category level. Findings from this study suggest that individuals of Posidonia oceanica with higher genetic diversity might be more resistant and resilient under potential disturbances. As low and medium levels of genetic diversity at impacted locations were not observed, the authors suggest that this might be the result of local extinctions of individuals that already exceeded their resistance capacity. Another possible explanation for the high diversity observed at high impacted locations is a temporal discrepancy with pre-environmental impact conditions. In other words, individuals of Posidonia oceanica have exceptional longevity and the currently observed levels of genetic diversity can have a much deeper history than relatively recent human disturbances. In summary, results from this study are valuable for restoration and mitigation of impacts of the anthropogenic disturbances but they must be interpreted with caution. There might be a temporal discrepancy that may falsely suggest good health status of seagrass, while there is an unnoticed gradual deterioration of genetic diversity. 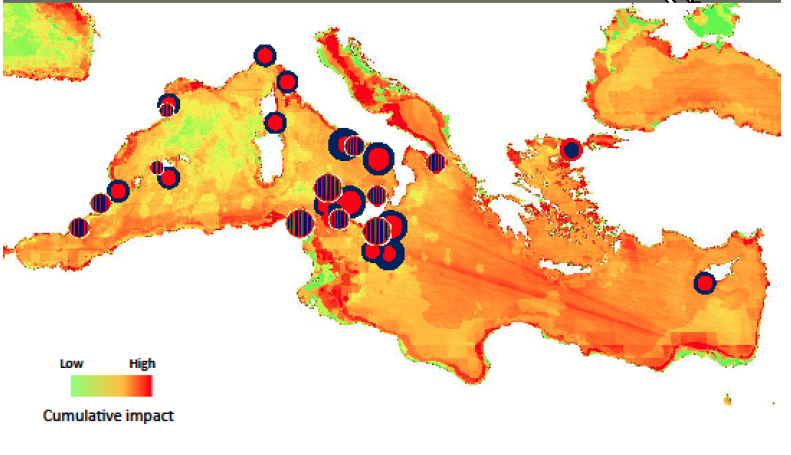 To distinguish between short-term and long-term impacts of environmental disturbances on the genetic diversity, maps with better geographic resolution could be used in temporal studies of connectivity between populations of seagrass. Studies like this one contribute to a better understanding of the causes behind changes in genetic diversity and what it means for the health status of the species. Tell me what you think in the comment section below! Were you expecting to see lower genetic diversity of seagrass in highly impacted areas? Does it make sense to you why high genetic diversity might not mean good heath status of the seagrass? Hi! I am a PhD candidate at Victoria University of Wellington. I study the genetic structure of organisms and how the environment influences genetics. Check out my website for more information!